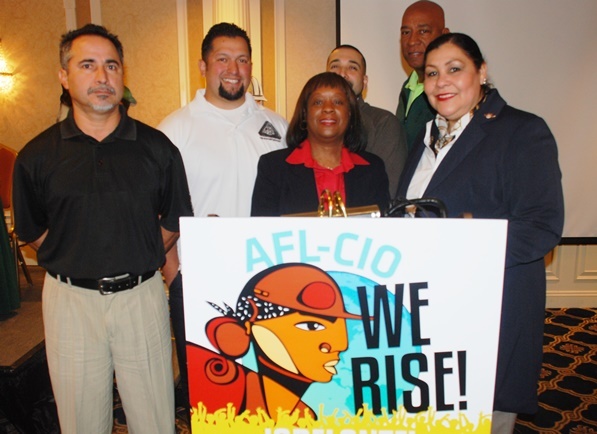 From left, Calixto Tapia, IAM District 725 Organizer; Joe Solis, IAM Special Representative; Diane Babineaux, IAM General Vice President; Alfredo Silva, IAM District 160 Organizer; Steve Cooper, IAM Grand Lodge Representative; and Monica Silbas, IAM Legislative Representative at the AFL-CIO “We Rise!” immigration summit in Washington, DC. A group of IAM members spent a week developing skills to better interact with immigrants, especially those in search of strong union representation. Watch “IAM Attends Labor Immigration Conference” on the Machinists News Network. The AFL-CIO’s summit on immigration outreach brought more than 200 union members to Washington, DC to attend trainings, workshops and strategy sessions designed to empower immigrants and enhance the rights of all workers. “It’s really an opportunity for us to be involved in our communities and to be leaders in the movement,” said IAM District 160 Organizer Alfredo Silva, who originally migrated from Mexico. More than 5 million undocumented workers in the U.S. are now able to apply for work authorization after President Obama announced an expansion of deferred action in November 2014. Immigrant workers face a higher rate of wage theft, sexual harassment, and death and injuries on the job than any other group in the U.S.
“These are working-class folks who have had a barrier to becoming part of society and potentially becoming union members,” said IAM Special Representative Joe Solis. IAM members learned how to conduct outreach events in their community to walk people through the legal steps of applying for deferred action or citizenship.